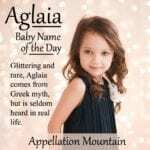 If we can call our daughters Bella, why not this handsome name for a son? Thanks to Virginia for suggesting Adonis as our Baby Name of the Day. Names like Kingston and Reign, are having a good run today. So why not Adonis? It comes from the Hebrew adonai – lord, and a word used in some versions of the Old Testament to refer to God. Earlier still, Adonis was the most handsome of the young men, enough of a looker to catch the eye of the goddess Aphrodite. He was killed while hunting, but Aphrodite’s grief was so great that Zeus agreed he could briefly return to life each year. 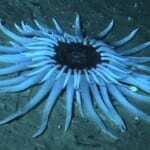 It’s said that the blood he shed became the anemone flower. It’s a pretty story, but scholars tell us that there’s far more to it. The death and rebirth of Adonis featured in various Greek mystery religions and ceremonies. For centuries, the name has referred to a handsome young man. The ninth century Bishop Ado of Vienne is considered a saint, and was a widely respected writer in his day. His name is also recorded as Adon, and the Latinized form? Adonis. 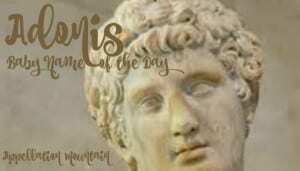 Then there’s Adonis, also spelled Adunis – a Syrian-born poet who chose the mythological moniker as a pen name. He’s lived and worked in Lebanon and Paris for much of his adult life. Adunis may not be a household name in the English-speaking world, but he’s widely considered among the greatest living Arab poets, and he’s often mentioned as a contender for the Nobel Prize in Literature. He’s not just a writer. Adunis has also translated great works into Arabic, edited poetry magazines to promote the works of other poets, and opposed attempts to use poetry as political propaganda. He’s also know for his works of art based on calligraphy. Here’s another twist. If you know your Rocky Balboa, you’ll remember that the fictional boxer faced off against Apollo Creed. In the original story, Rocky was an unknown, an underdog who trained hard to compete against Creed, the undisputed heavyweight champ at the time. The 1976 movie was a sensation, and multiple sequels followed, with more appearances from Creed, played by Carl Weathers. The would-have-been final installment came in 1990, but fans considered it a let-down. Sixteen years later, 2006’s Rocky Balboa was a much bigger success. That opened the door to yet another spin-off – Creed, which debuted in November 2015. It’s the story of Rocky training the late Apollo Creed’s son, Adonis. 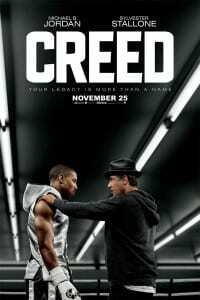 The young Creed proves to be a formidable boxer, and the movie has been successful. The character often answers to the nickname Donnie instead of his bold given name. And yet, Adonis would be an on trend choice in 2016. It fits with ancient names on the rise like Atlas. 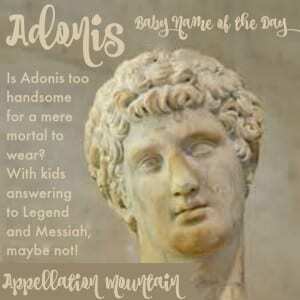 And while Adonis is synonymous with handsome, it’s not as bold a boast as Legend, Messiah, or Maverick, all big, bold names that have gone mainstream in recent years. 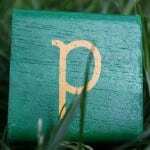 A handful of boys were given the name early in the twentieth century. The name was briefly more popular in the 1950s. Could it be thanks to mobster Joey Adonis, who made headlines in the 1950s? By 1993, the name had cracked the US Top 1000 – and it hasn’t left yet. The name peaked in 1995 at #576. As of 2014, there were 327 newborn boys named Adonis, for a ranking of #726. While Adonis remains relatively rare, it may be just on the right side of wearable in 2016. What do you think of Adonis? Is it too much to live up to? I think Adonis is a bit much, but I wouldn’t be surprised to meet a little Creed in the new future. Fans of Adonis might also like Aramis.